Here’s seven content marketing and SEO tips to help your business keep track of the details and get the most out of your marketing strategy. Content marketing is a ubiquitous term in the entrepreneurial world yet many wrongfully presume it’s simple: You write some content, publish it online and shortly thereafter people flock to your website and buy your product. Right? As a small business owner or entrepreneur, you know the process is much more involved, calling for niche expertise and far greater attention to detail. Beyond simply writing the content, you have to ensure that your target audience will actually want to read it, optimize it for SEO and then promote it in the right circles. Otherwise, your content is doomed to become another long forgotten URL aimlessly floating around the internet. 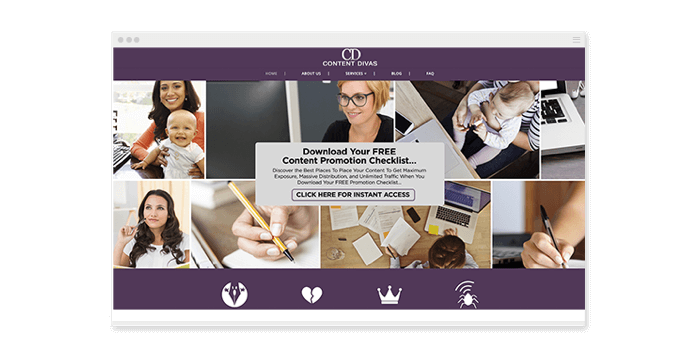 When implemented correctly, content marketing has the power to boost your domain authority, skyrocket your qualified lead generation and position you and your business as industry experts and thought leaders. The question becomes not if content marketing is right for you, but rather how can you best navigate the many channels of content marketing to fit your business’s goals? Here’s seven content marketing and SEO tips to help you and your business keep track of the litany of details and get the most out of your marketing strategy. Keyword density isn’t dead, but the game has changed. You certainly want to utilize keywords in your content, but more importantly, you need to include expert verbiage. For example, say you have a website about golfing. Google wants to see that you’re talking about expert topics related to golfing: Tiger Woods, the best golf courses, new clubs and balls, etc. If you have reputable content on your website that addresses and expands upon these popular topics, traffic is going to come in through all these channels. Because of the specific topical incoming traffic, Google will rank your golfing website very high for those terms. To get a better mental picture, try imaging Google as a club that cares a lot about its very inquisitive members. The whole point of the club is to give its members the best possible answers to every question they have related to a topic. If your website can answer all those questions and give its members what they are looking for, then Google will give you more credibility and rank you higher for making its job easier. When you search a keyword that’s related to your business on Google, a category of related search terms and questions appears at the bottom of the results page. These are the topics that your potential customers and target audience are searching for. Say your back has been bothering you and you want to buy a yoga mat to start stretching, so you type “yoga mat for back pain” into the search engine. 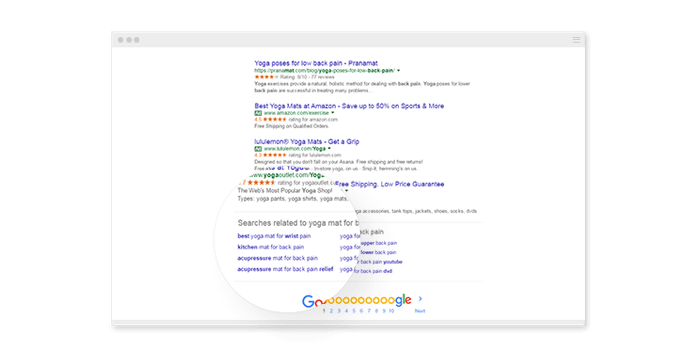 Instead of just firing off results for yoga mats, Google populates the bottom of the page with frequently related terms and questions that can prompt your next search. In order to get search engines to send more traffic over to your website and rank you as a credible source, start generating content that answers those frequently asked questions. Having relevant and information-rich marketing content is great, but make sure you’re not trying to cover too many bases at the same time. You have to make each content piece specific enough that your customers can quickly find the information they want without getting overloaded. Your audience many want to hear everything you have to say on a particular topic, but not all at once. If you’re a physical trainer and want to create a guide to healthy living, you may decide to include everything from healthy recipes to different exercise regimens to the best running trails. However, part of your audience might just be interested in what you have to say about diet and cooking. By breaking up your guide into multiple smaller guides, each covering a unique aspect of healthy living, you won’t risk alienating any segment of your audience. Plus, you just created multiple opt-in channels for your content instead of just one. 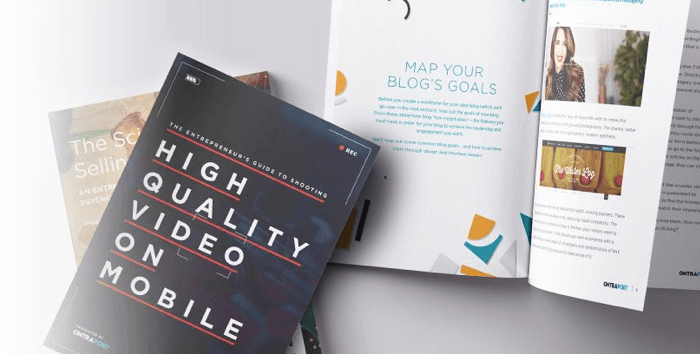 We employed this exact tactic with our ebook strategy and created over a dozen guides that deep dive into specific topics of entrepreneurialism and business building. Think of it like “pagination” on a website, or breaking up your content into relevant, individual pages that can stand alone. This will give you the flexibility to promote your content to more targeted and specific audiences. How you brand yourself is everything. A strong personal brand that showcases your expertise gives you credibility and a unique edge over a sea of competition. As Shelby Larson, co-owner of Content Divas said, “I recently closed the biggest deal of my life and it wasn’t because of my website, but how I positioned myself as a force in the content marketing space.” Branding expert Michelle Villalobos has successfully branded herself as a “Superstar Accelerator” and stresses the importance of maintaining a consistent brand across all platforms. Everything from your website to social media platforms to speaking engagements should cultivate your brand. Your brand is the first thing that people think of when they hear your name, so what do you want that to be? When it comes to word of mouth marketing, your satisfied and loyal customers are your biggest advocates. Firsthand testimonials from your customer base hold more clout than you may expect and can deliver more sales than almost any other form of marketing. Think of it this way: When your business delivers a remarkable experience, satisfied customers on the receiving end are going to tell their friends and associates about it. Thanks to social media, good news travels fast. Building a list is paramount for new business owners who are trying to get the word out to the right people. You could have the best content out there, but if no one sees it, your business isn’t going to grow at the rate you want. By promoting free educational content such as ebooks, online workshops and tutorials in exchange for your leads’ email addresses, your contact list will grow naturally. No matter what Google does with their SEO algorithm, understanding a buyer’s intent will always be your failsafe marketing tactic. Find out why people are buying your product and learn what accompanying products they might be craving. What do your customers consistently need? What are the problems that they are struggling with? By shaping your content to answer the questions that your audience consistently asks — rather than just focusing on promoting your product — they will connect with your content on a more personal level.